Woojer is a device that converts sound to vibration in order to enhance the sound experience. 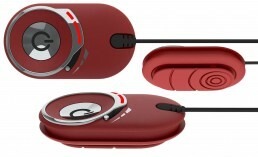 This device can be positioned on the shirt or the belt and is connected to any sound output from music players to gaming devices. The experience of wearing a Woojer is similar to standing near a big subwoofer and feeling the vibration all over the body. Another use for this device is to help people with hearing problems feel the sound that surrounds them. A2Z-DESIGN has designed the Woojer device to reflect from the outside its function as a soundwave converter and amplifier enhancing the experience of sound.